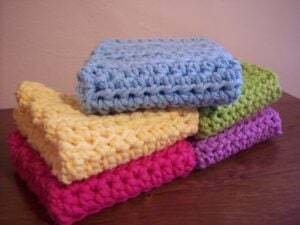 Enjoy these crochet dishcloth patterns for in the kitchen, the bathroom, or for cleaning and dusting throughout the home. 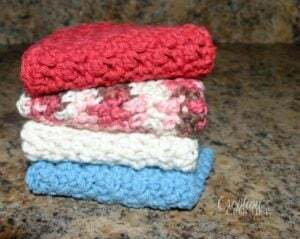 Crocheted dishcloths make for durable cloths, not only for the kitchen, but for around the home as well. They make for excellent and gentle scrubbers for your dishes or for your face and body. And they are also great for dusting around the home. 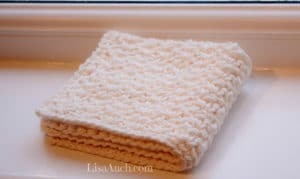 Many of these dishcloths have a lovely texture, which makes them natural for scrubbing. Plus, a few of these are also pretty enough to use as doilies. So what are you waiting for? 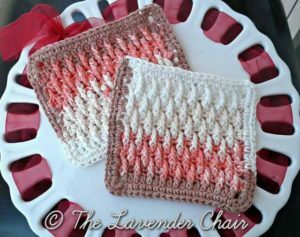 Why not check out the following free crochet dishcloth patterns, and make a few for yourself and a few for gifting. 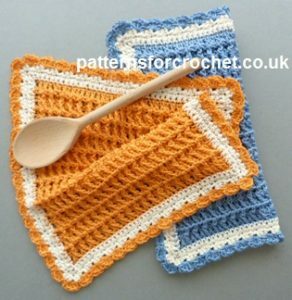 This dishcloth pattern is worked in the front loops only, thus giving you a nice soft cloth for your dishes or the face. 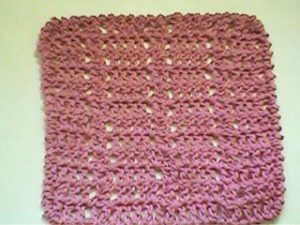 The finished size measures 7 inches square, but is easy to adjust to any size you want. 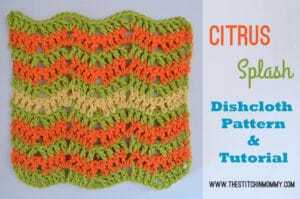 Crochet this dishcloth in any seasonal stripes. The ones shown are perfect for the summer, but it’ll look just as cheerful in fall, Christmas or Easter colors as well. 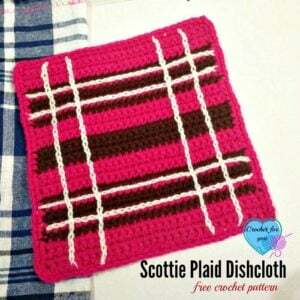 The pattern is perfect for learning your chevron stitch as it comes with lots of photos. 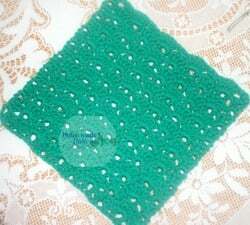 The pretty lace in this dishcloth is sure to impress your guests. And I’m sure it’ll look lovely in all sorts of variegated colors, or any color to match your kitchen. 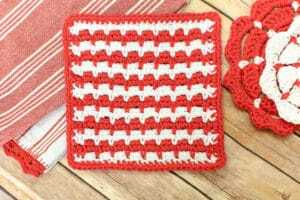 Crocheted in the Canadian Patriotic colors; however, this dishcloth is perfect for celebrating any holiday or occasion throughout the world. 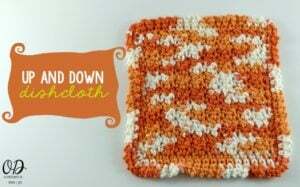 This pattern looks great in a dishcloth, and looks like the texture will make scrubbing easier for you. The pattern also includes the stitch multiple, so you can basically crochet this to any size you want, including a full-sized afghan. 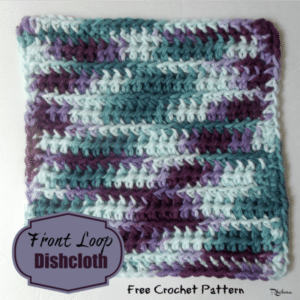 If you love simple stripes, then this dishcloth pattern is for you. With only two colors, it’s the perfect way to clean up your stash and make something that you can re-use over and over again. 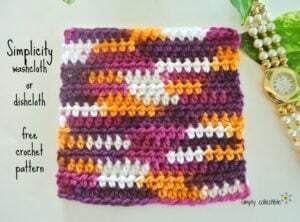 This colorful dishcloth can be crocheted in any fruity colors to match your kitchen decor. 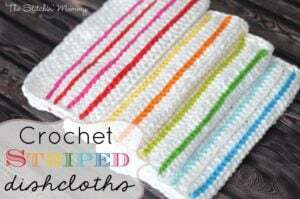 The pretty colors are added simply by slip stitching across the finished dishcloth. This dishcloth looks like it’s the perfect cloth for beginners to learn on. It’s simple, but perfect for anything and everything. 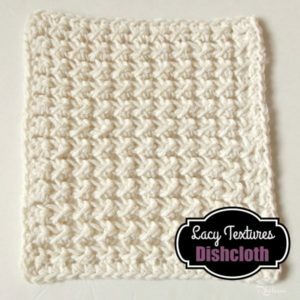 Add a bit of textures to your kitchen with this elegant looking dishcloth. 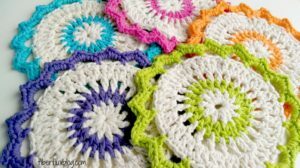 Crochet it in one or more colors to match any decor. The pattern also provides you with a stitch count so you can increase to any size you want. 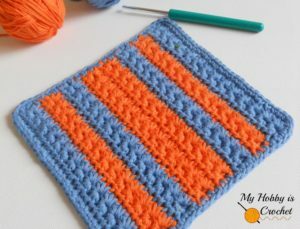 Here is another pretty dishcloth pattern with surface stripes. And it’ll look great in any gift basket as well! 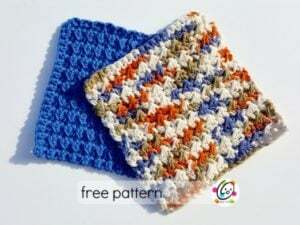 Here is a nice and large dishcloth pattern for those who enjoy the larger cloths. Plus it’s got a lovely texture to trap lots of debris. Do you get the downs when having to wash your dishes? 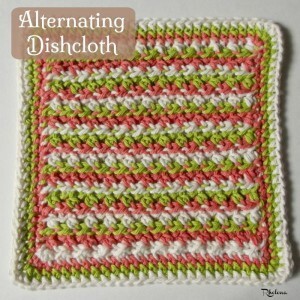 Well this dishcloth will help with that as it has a lovely texture to make your job easier. 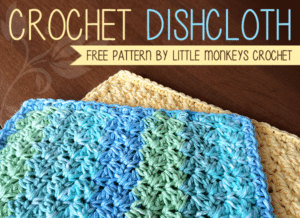 It may be easy to whip up, but check out the gorgeous textures this dishcloth presents. It’s great for gifting or for use around your own home. The finished size measures 9 inches square. But the pattern provides a stitch multiple so you can crochet this to any size you want. Here is another colorful design with lots of textures. Choose any three colors to make it easy for color changes. Simple is always good, which makes this a handy go-to pattern. Plus, the stitches are easy, making this also a suitable pattern for beginners. The stitches go up and down in this dishcloth. Hence you get a lovely texture that’s perfect for scrubbing. The flowery design makes this cloth perfect for the summer. Or, use it as a pretty doily around the home throughout the year! The pretty textures are created with post stitches, making this also a very durable cloth for use around the home. This is my kind of cloth because it only measures 6″ wide. It’s great for small hands and also features a lovely texture. This is crocheted in no ordinary v-stitches. 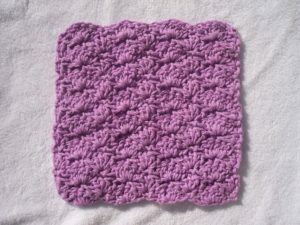 It’s a more solid and textural v-stitch, which makes it ideal for a dishcloth. 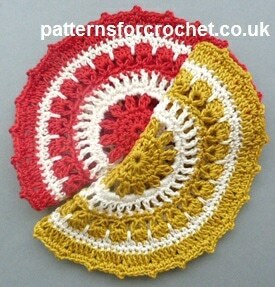 Here is another pretty pattern that can be used for cleaning as well as for a pretty doily. The finished size measures 9.5″ across. The elegance in this cloth makes it ideal for gifting at weddings and/or during the holidays. You definitely can’t go wrong with the linen stitch. It’s quick and easy to whip up, and it results in a beautiful texture! On the pattern page you’ll find a link to a chart for the linen stitch. 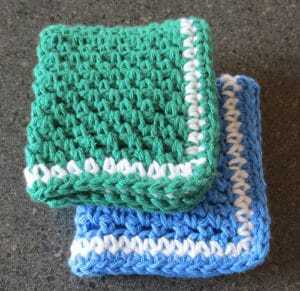 The pattern then provides you with the stitch count you need to make a dishcloth. Check out the gorgeous textures in this beauty! And it’s great for scrubbing and dusting anything and everything throughout the home. Last but not least, we have yet another beautiful and textured cloth. It’s a small cloth, but the pattern gives a stitch count to increase the size if you need to. 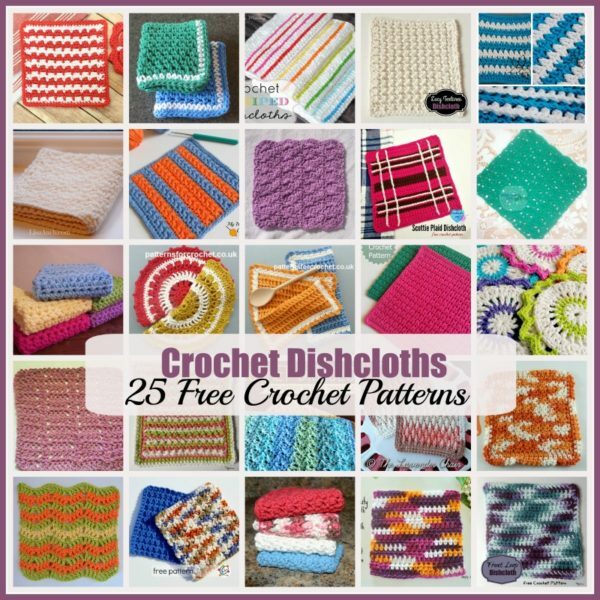 So there you have it, another collection of 25 free crochet patterns. 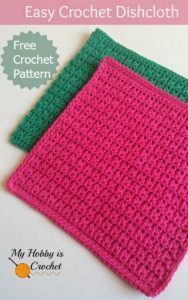 And if you like, visit Crochet Pattern Bonanza for over 100 more FREE Crochet Dishcloth Patterns.